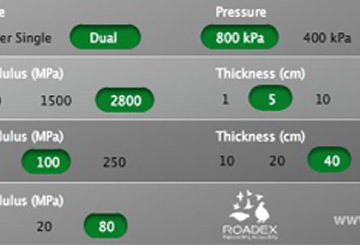 Which of the following cases should be taken into account when using the ROADEX Odemark method for bearing capacity calculations? If the subgrade soil is peat, the Odemark calculations can give bearing capacity values that are too low. In this case the new designed structure should be made thicker than the Odemark dimension method proposes. 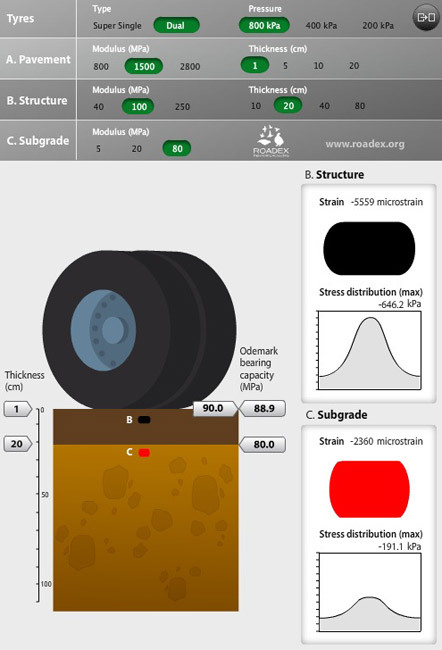 If the drainage system is in very poor shape, the Odemark calculations will give low values. In these cases the best solution is always to design thick structures. If the drainage system is in very poor shape, but is planned to be improved one year before the actual rehabilitation, the surface moduli can be set 10-20MPa lower than the target moduli. There are no exceptions. 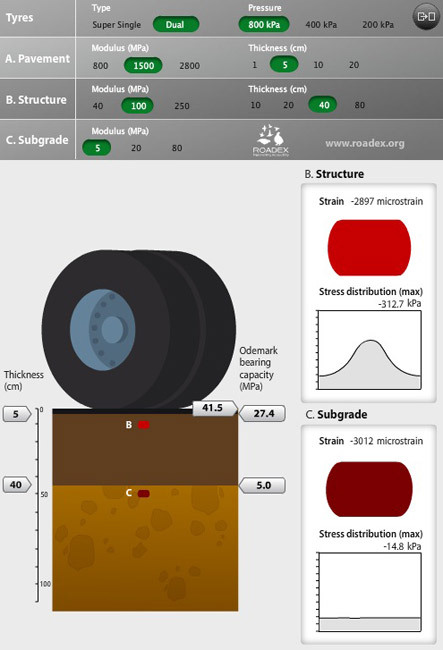 Odemark calculations are always reliable. 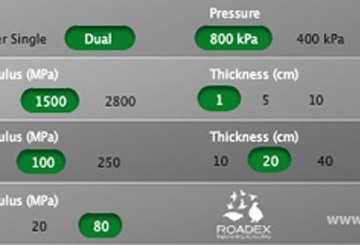 What is / are good solution /solutions for a paved road section (old pavement thickness 75mm) suffering from severe Mode 1 rutting? 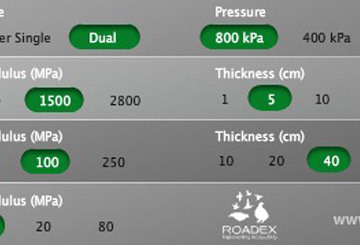 What is / are the optimum solutions /solutions for a paved road section which is suffering from Mode 2 rutting (old pavement is 75mm)? What is / are the optimum solution / solutions for a gravel road that is suffering from Mode 1 rutting? None of above mentioned, because Mode 1 rutting cannot exist on gravel roads. What is / are the optimum solution / solutions for a gravel road which is suffering from Mode 2 rutting? The subgrade and pavement are weak. The best solution is to perform soil replacement. The subgrade is strong. The pavement is also strong, but is too thin for the relatively weak structural layers. A good solution would be to lay a new pavement layer on top of the existing. There is nothing wrong with this structure. The subgrade is probably weak silt. There is a high risk for Mode 2 rutting. A good solution would be to add new layers on the top. The road has high risk for Mode 1 rutting. A good solution would be to use trucks equipped with CTI-systems. The subgrade is probably silt and the road has high risk for Mode 2 rutting. At least the drainage should be improved. A thin and weak structure over a strong subgrade. A good solution would be to add 200mm of new good quality base course material on the top of the existing structure. This will also reduce the possibility of frost heaves.